Kendall Circle is a 10(ish) acre plot of land adjacent to Dorothea Dix Park and the Pullen Park Terrace neighborhood. It is part of the Centennial Campus Spring Hill District of NC State. Kendall Circle was originally a part of the Dorothea Dix Hospital Campus. During the 1950’s, a community of small houses were built around the circle, sprinkled amongst the large oak trees. These houses were originally built for workers at the hospital. Later, it is said that the houses were used for patients who needed to be close to the hospital, but were able to live on their own. In 1990’s, the houses were no longer used, and they were removed from the property in early 2000’s. Kendall Circle is now informally and unofficially used by the citizens of Raleigh as a park. It is mistakenly assumed by most who use it that it is a part of the Dorothea Dix Park, rather than it being a part of NC State. Kendall Circle is seasonally used for criterium cycling races, it is on the circuit of various city running races and marathons and people from all over come to walk, jog, ride bikes and play with their dogs on the loop. Kendall Circle is a special place, and has a character that is uniquely different from the almost all of Dorothea Dix Park. The main difference is that the circle is heavily wooded with large oak trees. The trees are much more numerous than most of Dix, making it feel like a large hardwoods forest rather than the dappled pastoral quality of the park. The amount of wildlife living and using Kendall Circle is astounding—from deer and fox to owls and hawks. This area of significantly large oak trees is a park-like open space for passive recreation and serves as a buffer to the adjacent Pullen Park Terrace neighborhood. Development of any amenities in this area must be consistent with the Shared Open Space concept and preserve the trees and vestige of road remaining as a pedestrian/bike trail. A pedestrian link from this road to Rocky Branch Greenway along Western Boulevard will be provided as this area of campus develops. In addition, a pedestrian and bike link will be provided from Kendall Circle Park across Centennial Parkway. More than two-thirds of Centennial Campus land is designated as open space and is not intended for building development. 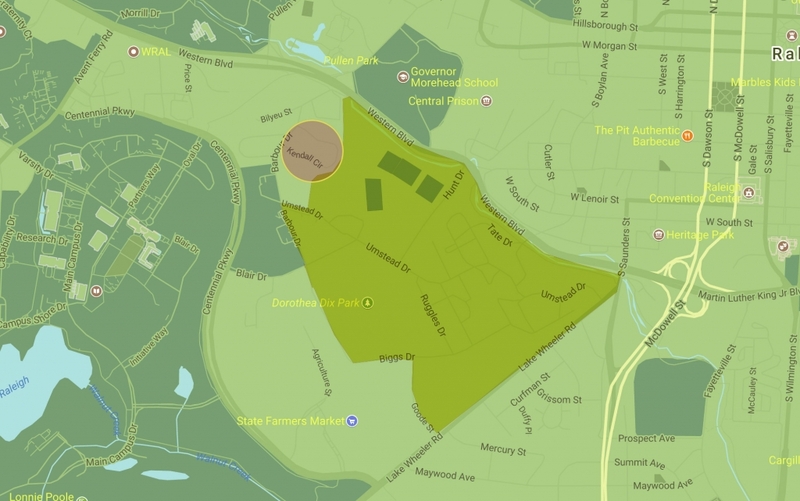 The configuration and connectivity of this open space is a primary defining characteristic of the campus…In addition to the campus courtyards serving campus buildings, there are three planned open spaces east of Centennial Parkway at Spring Hill: the tree grove at Kendall Circle, the conservation area associated with the Walnut Creek tributary, and the open space with a view of downtown Raleigh that will be created from the parking lot adjacent to the Council Building. In 2015, NC State hired McAdams Co. to develop a new Master Plan for the Centennial Campus Spring Hill District, which includes Kendall Circle. As of March, 2018, there is no public word on the planning. NC State has no public plans in the immediate future for Spring Hill. The Dorothea Dix Park Master Plan will most likely impact the decisions made for a new Centennial Campus Spring Hill Master Plan. In February, 2018, an official survey was completed of Kendall Circle and all or most of the Centennial Campus Spring Hill District, upon request from NC State.